Is Skinny Prosecco worth all the fuss? Before we go any further let me say that I love fizz. I love cheap fizz expensive fizz free fizz white fizz pink fizz even red fizz. Fizz floats my boat. There. I love fizz. But I don’t like Skinny Prosecco. My friends don’t like it. I know this because I asked them and when I asked them they didn’t know they were drinking it. I’d disguised the bottle by wrapping it in tin foil in a little fizz blind-tasting. They never need much persuasion in becoming my taste-test guinea pigs. They’re trained now you see. It’s taken me a while, but they know to look, smell and concentrate when they sip wines with me on a fun tasting night (I don’t imagine for one minute they’d do it down the pub). They then write down what they think. This particular night the Skinny was my first mystery fizz and I poured it into my pals’ eagerly-clasped wine glasses; their faces upturned and giddy like only girlies’ faces can be as bubbles are being poured. If you’ve been living on Planet Never Heard of Skinny Prosecco then you won’t know what I’m talking about. Skinny Prosecco is the brainchild of Amanda Thomson and every credit to her for seeing a gap in the crowded prosecco market and developing a wine which sits within her lifestyle beliefs – she was raised on a vegetarian and no-sugar diet. When Amanda gained a diploma in wine she then began the journey towards creating her own. Her company Thomson & Scott first developed Thomson & Scott Skinny Champagne Grand Cru which contains up to 0.1g of sugar per litre. There’s also a pink champers. It was all over the Internet in the summer – endless stories being published as girlies’ ooooed and ahhhed over this low-sugar “phenomenon” which sold out in Selfridge’s a week after launch. Yes, a huge hook is the tiny amount of sugar – although Amanda is also very driven by organic, vegan, and energy-reduced credentials. Skinny Prosecco – loads left in the bottle. Anyone for any more? I enjoy a glass of prosecco but it will always be two-dimensional – fizz and easy-drinking flavours. There’s nothing wrong with that. Prosecco isn’t a complicated beast. The majority is made using something called the tank method where a base wine is placed in a tank (the grape used in prosecco is called glera) with sugar and yeast for a second fermentation. The resulting sediment is filtered away and the wine is bottled under pressure. Many inexpensive wines across the world are made in the same way. The most commonly found prosecco is marked as a DOC and DOCG is the best you can get. Skinny Prosecco’s classification is DOC. This sparkling Italian wine has taken the UK by storm but it is never going to deliver the multi-layered aromas and flavours of a cava, or a crémant, or a champagne. Those are made in the traditional method, by adding base wines to a bottle for a second fermentation and then ageing. Complex flavours and aromas develop because the wine is in such close contact with the yeast. I hope I’ve not bored you there. Girlie verdicts are coming up soon. But surely low sugar’s the thing here? You’ll be saying ah but …. Skinny Prosecco has really low sugar! You can’t get that in a crémant, a cava or a champagne! Ah but …… yes you can. Skinny Prosecco has up to 7g of sugar added to each litre which is 1.5 teaspoons of sugar per bottle. Is that unusual? Is it a new concept to have such low sugar? Errm no. Not even in prosecco. Look I’m not going to bore you with the fine detail, but here’s the descriptions you can look out for on a fizz label. Starting with no sugar and rising …. brut nature, extra brut, brut, extra dry, sec, demi-sec, doux (doux is the sweetest). Brut nature has 0-3 g of sugar per litre, and extra brut has up to 6g per litre. Skinny Prosecco’s bottle is marked as Brut – so there are two lower classifications of sugar levels. These lower sugar wines are out there. This low sugar thing is not new. Eventually I’m getting to the point. What did the girlies say. Remember, they didn’t know they were sipping Skinny Prosecco. These are girlies who don’t have a point to prove, they tell it like it is. I think that’s why they’re my friends. It’s like flat soda water. Can I pour in vodka. Pear aromas, bland, quickly falls flat both in bubbles and fruit flavour. Take the sugar away and you’re left with nothing. The biggest critique from the girls wasn’t in their words but in their actions. We had a fizz fest that is for sure. By the end of the night the only bottle with any wine left in it was Skinny Prosecco. No-one wanted a second glass. I poured half a bottle down the sink the next morning. It is £17.99. So about a tenner’s worth was poured away. I appear to have gone on a bit. This started out as a simple little piece sharing some girlie thoughts on this year’s Skinny Prosecco Social Media Explosion which at the time had me shouting at my Twitter and Facebook feeds wanting proper journalism, reviews, opinion, taste tests. 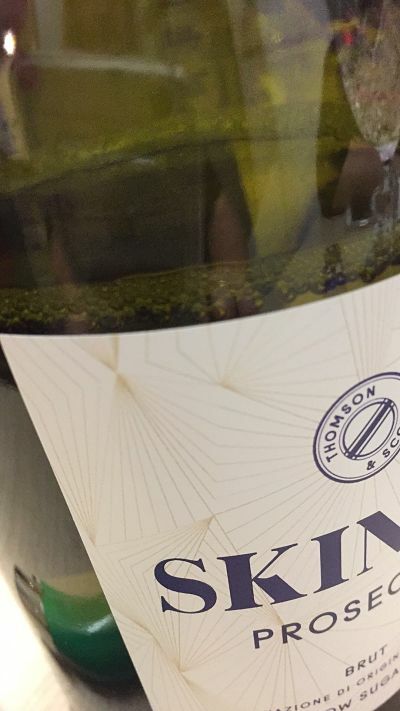 Not clicky-finger shares of a wine because it had some excellent profile-raising marketing behind it and a Bang On name delivering exactly what the target market wants. Sorry I’ve gone on so long. I’ve wanted to explain the low sugar “hook” a little bit more. Yes – you’ve got to admire how hard Amanda has worked to develop the brand. Yes – High Five to the clever marketing campaign. Yes – I’m sure people will continue to support the concept and buy the wine whatever people like me say. But I want you to see the wine-making method in a wider context. Don’t jump on the social media shareable frenzied bandwagon clicking likes and thumbs ups and oos and ahhs and think that this low sugar process is a unique principle. It isn’t. There’s lots of winemakers out there making similar decisions with their wines. You might be saying, never mind that, this is prosecco we’re talking about. Prosecco with low sugar. I love prosecco. That’s all I care about. Fair enough. So after a bit of Googling I’ve found low-sugar champers, prosecco and cava at The Fizz Company – don’t know what it tastes like mind. The prosecco is cheaper and one of the wines is a silver medal winner at the latest 2017 International Wine Challenge awards. Look. We didn’t like the taste of Skinny Prosecco. The bottom line for me is, if you’re going to have fizz, and you’re prepared to pay nearly £18 for it, at least have a fizz that has flavour. For goodness sake, fizz is supposed to be enjoyable! Since when did we cut out the tasty fun bit! As an aside, and a pertinent example, here’s a tasty low sugar fizz I found at the Wine Gang fair in Leeds in November. 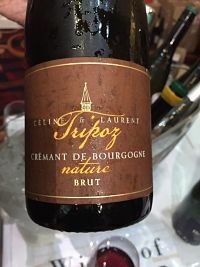 Domaine Tripoz Crémant de Bourgogne Nature was scrummy. It’s a crémant. It has flavour. Layers of flavour. It is cheaper than Skinny (£15.95). If you’re worried about the sugar, well it has ZERO sugar. Yes. Zero. The clue is in the word nature on the label. I mentioned that didn’t I. Look out for clues on the label. You can buy it from Wine Sensations here. There. I think I’ve fizzled out now. Previous PostPrevious A festive gin cocktail with Brussels sprouts. Yes, you read that right. Next PostNext Christmas red wine to suit everyone’s pockets!